This page will contain cultural, language, food, and other information of interest to members. These exhibits were displayed January 5 through April 12, 2009, at Star Antique Mall, Snohomish. 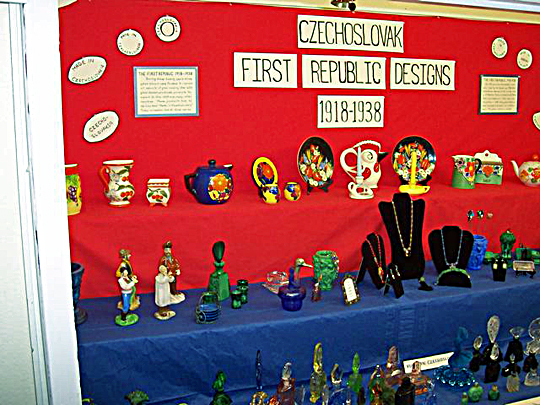 The first exhibit was CZECHOSLOVAK FIRST REPUBLIC DESIGNS 1918 THROUGH 1938. Ceramics, glass items, and perfume bottles and sets were featured. These items were designed between 1918 and 1938 when the country had its first freedom of only twenty years. 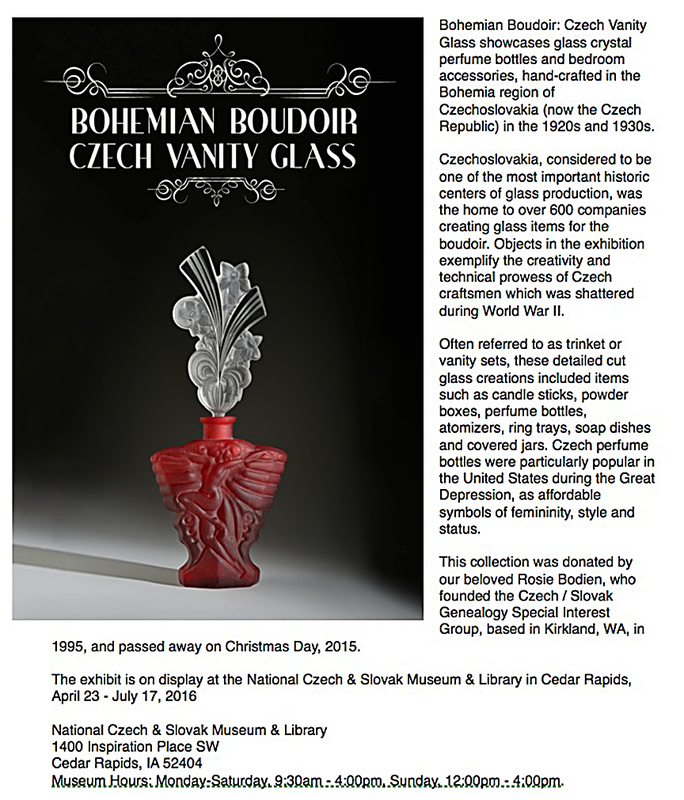 The CZECH AND SLOVAK COLLECTION FEATURING FOLK COSTUMES was the second exhibit. Colorful folk costumes on SLIP and TVOBA LIDOVA dolls brightened up the case. These First Republic items are very collectible, first because there is no longer a Czechoslovakia. Second because after Hitler, these items were no longer made, making the "Made in Czechoslovakia" signatures very special. Little Prague European Bakery and Deli has many traditional bakery items, including apple strudel and kolace and also serves a good home made Czech meal. It is owned and operated by Marie Makovicka and located in West Seattle at 6045 California Ave SW (206-935-7237). BUT you must call ahead if you want to get any of the above. Marie's bakery is not open daily, mostly by appointment. She does the University Saturday Market and the Fremont Sunday Market during the winter. (Google them for exact location ). After that she is busy baking for all the summer markets, too. Remember to call ahead!!!!! Council of Higher Education grants scholarships to American and Canadian students of Czech, Slovak, and Ruthenian ancestry who plan to continue education in undergraduate and graduate programs on the basis of need and academic achievement or excellence. Helene Cincebeaux and I have been trying for three years to get the Baine/Cincebeaux folkdress exhibit "Stitched with Love" to the Seattle area. First Jara Soldenova, the Czech language instructor at University of Washington, and I tried to get it to the Henry Gallery which is a part of UW. They were a little huffy that they had their own collection of folkdress. Seattle Art Museum was interested but they are doing renovations now and are really "back ordered with collections." The Frey Museum curator said "try to catch me" as I would call to make appointments. The Bellevue Art Museum curator wouldn't even acknowledge that I called. Bellevue Community College had no venue for the exhibit. Woe is me. Then the angel Jara Soldanova approached the University of Washington Library Eastern Studies person Michael Biggins. He agreed to have the exhibit to promote the annual Slavic Fest in April. Yeah! Finally! Only to have Dr. Biggins say we couldn't have the main exhibit hall at Suzzallo Library. It would be downstairs in the Special Collections exhibit case. Oh well, I thought, I had my foot in the door. Thus I had to call Helene and explain it is not a grand venue. We went for it. So I went to the Slavic Fest planning meeting in the bowels of an old university building in the dead of winter. I wander the dark campus looking for the right building, then trying to find the right room in the second basement. Help! What am I doing? I was the first one there, scary at first, but others did show up. I was armed with Helene's books and resume. I had Jozef Ivaska's CD and write ups. Bravely I face the Russian, Croatian, Ukraine and Polish people who always run the Slavic Fest. Not a Czech or Slovak representative there. Yes, they are pleased to have Helen and Helene's exhibit to promote Slavic Fest, but no, your Jozef Ivaska cannot be the lead singer for the party in the evening. Yes, he could sing for 10 minutes before the lead singer, but that is all. So I sorta agreed to that (another foot in the door?). I didn't have much to say and left. But it was fun setting Helene up with lacemaker and needle arts guilds in the area. The professor at the UW Fiber Arts Department was thrilled to have Helene visit her graduate student class. The Kladno Sister City group in Bellevue, WA was interested in a presentation by Helene and Jozef but everybody was SO BUSY and hard to catch. Luckily I made"one of my phone calls" the day of their meeting and was invited to tell about the program. I went and came out of there with a hearty endorsement. You just have to keep bugging these folks, they are volunteers, too. Alas! It was coming together for the Slavic Fest on April 29th. Then my family started to make this complicated. Son Scott wanted my husband and I to cheer him on at a half ironman in eastern North Carolina on May 6. Hmm, can we leave here May 2nd after Helene and Jozef leave and drive across country in our van in 4 days? Not really. So my husband is to leave April 28 for Nashville, where he will pick me up at the airport. Then we can get to Charlotte NC by Friday and go to the half ironman. The leader of our Czech cultural group, the Mai Association, said he would sponsor an evening of Jozef Ivaska's singing the night of the Slavic Fest. So goodbye to the 10 minutes of the other event. But then the Maj Assoc. fellow backed out 6 weeks before the Slavic Fest. Help! So I called Karol Osusky, honorary Slovak community leader in the Seattle aea. He said he would put together a Zabava/Majales event the Saturday night of the Slavic Fest with Jozef as main attraction. Whew! Another hurdle behind me. So April 12th 6 big boxes arrive at my house with Helene's folk dress treasures. Then Helene arrives April 21st for her first visit to the Pacific Northwest. The weather is sunny and grand. The next day we drive to the lacemaker's guild. I left my car lights on so the lacemakers' husbands are jump starting the battery. The ladies loved learning about the 6 kinds of lace made by the Czechs and Slovaks. Next we need to go to the Czech/Slovak Interest Group meeting back in Kirkland. We made it in time! Thirty-six people come to the meeting and loved learning how Helene researched her family and how that led her to collecting folk items. April 24 we transport the boxes to the UW Suzzallo Library. Helene's face drops as she sees the display cases. But then on the way to the Fiber Arts class we see a lady putting books in the main display hall because the scheduled exhibit did not come. So, we ask if it is possible to put "Stitched with Love" in the main exhibit hall. YES!! Plus the students showed real interest in Helene's talk and folk dress items. Helene and I labored 2 1/2 days putting up the exhibit. We created hanging lines in light socket holes, we stuffed items with crushed paper to make them stand up and put boxes inside vests to make them stand. Creativity was at its highest! Actually it was a networking experience because Czech language students, the instructor Jara, and fiber Arts students floated in and out to help. The "Slavic Fest" on April 29th consisted of the Grand Opening of the "Stitched with Love Exhibit", the exhibit itself (thru June 8th), a parade of the different Slavic nations folks, a talent show of Slavic children, and the evening programs of Russian entertainers or the Zabava/Majales with Jozef Ivaska as entertainment with Czech/Slovak food and dancing. The next day the Czech Language department at UW would sponsor a program of Helene's slides and Jozef's songs at Allan Library Auditorium. Well, the Grand Opening was a hit!!! The Honorary Czech Consul Marie Amicci, who had just returned from Prague, found her way from Lake Oswego,OR. The Honorary Slovak Consul, Rudy Zigmund, from Bainbridge Island came, too. We had the library's permission for Jozef to sing and play the recorder as he led the "villagers" (exhibit attendees) from the exhibit hall to Allan Auditorium for the Grand Opening. Many people came wearing folk dress. My sister form Alturas California wore a Piestany kroj. Her husband surprised us all by happily wearing the kroj my grandmother made for my uncle. There were three children in kroje. Others were happy to wear family treasures. Somehow it all came together beautifully. That evening the Zabava/Majales attracted about 160 people. People were happy to eat the ethnic food and drink that Czech beer. People were singing special Moravian songs and doing the Czech and Slovak dances. Jozef sang his heart out, working the crowd and refreshing fond memories for many folks. Young folks and older folks were out there dancing. Lines of dancers were snaking in and out of the other dancers on the floor. Some folks came in folk dress. Some came for the food. There was a Miss Majales contest. At this point Helene and I just stood on the stage and rejoiced. WE DID IT! WE WERE THERE TO HELP CELEBRATE OUR CULTURE WITH ABOUT 160 OTHERS IN THE SEATLE AREA!!!!!!!!! !The Czechs and the Slovaks were rocking together that evening . We went home that night in triumph, we were tired but oh so happy. Sunday morning Jozef was a little hoarse from singing so much the night before. But he came through at the afternoon performance. There were problems with the sound equipment so Helene and Jozef took turns with their parts of the program. They work so well together. It was actually comical as it worked out. We were all laughing as well as enjoying culture through Helen's slides and Jozef's music. My sister Emilie brought my 96 year old dad, Ladd Loss, to this program. Jozef brought tears to Dad's eyes as he sang his favorite song, Ceska Pesnicka. Dad sang along to Kolene, Kolene. There were tears in my eyes as Jozef sang Oh My PaPa to dad in Czech. The Czech and Slovak music and culture shared by Jozef and Helene radiated that afternoon. Not just in my heart but in all the hearts in that auditorium that afternoon. And the "Stitched with Love" Exhibit radiated until June 8th. It took a long time to organize that celebration of of our heritage, but it will stay in the hearts of those affected for a much longer time. This exhibit ran for 7 weeks at Suzzallo Library. We hope that in three or four years we can bring Helene Cincebeaux back with her lovely exhibit again. Thank you to all who attended and made this event a success! If you have interest in hosting a student from the Czech or Slovak Republics, here is some information and contact information.ISE, a non-for-profit organization that places high school foreign exchange students in private homes in the United States for a whole school year. In general, host families provide a bed and meals eaten in the home and the student pays all other expenses and has full insurance. Host families do not need to have teenagers of their own. Young families and empty-nesters make great hosts. The Center for Czech Education and Culture (CCEC) is a 501 (c) (3) nonprofit corporation founded to promote cultural and academic exchange between the Czech Republic and the Pacific Northwest. The CCEC aims to foster ties between the United States and the Czech Republic in the areas of culture, education and civil society. Going forward, the CCEC will strive to implement a range of initiatives and to build alliances across borders, while contributing to the sharing of knowledge and ideas.